One of the more interesting types of literature for many people is, in my experience, the biography. Fortunately the Kindle library has plenty of ways to accommodate this interest. While my taste tends more toward literary figures and such, one of the most popular areas to look at in today’s politically charged social environment is to look back through the historical political biography. There’s also obviously always a bit of an urge to understand what drove the people who inspire us. Here’s a few that I hope you might find interesting. Theodore Roosevelt is a figure of fairly mythic proportions in American History. He was a larger than life figure, practically a legend in his own lifetime, who struggled with problems that we can recognize today with no great amount of difficulty. He worked to combat corporate greed, terrorism, and environmental irresponsibility while making huge progress toward human rights reform and economic expansion. He’s also the guy we have to think for the national park system, if I remember correctly. I’ll cop to not having read through this one all the way yet, though I did pick up a copy based on great reviews and a good reputation. 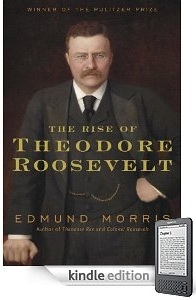 If you’ve ever wanted to know more about Teddy Roosevelt, this seems a good bet. I’d say it’s well worth it. It’s insane that anybody actually managed to live a life like his. 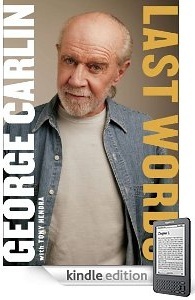 This is the autobiography(or sort-a-biography) of George Carlin. I’m going to make the assumption that you know who that is, because it would make me sad if you didn’t. I can’t even begin to say how much of an influence Carlin was on me, and I know I’m not alone in that, so it’s really amazing to get some insight into what made him the man he was. This isn’t a humor book like his other writings, though there are laughs to be had, but I simply can’t recommend it enough. It’s rare that anybody can be such a public figure, with so many admitted faults, and still have such amazing personal integrity. He made it through family trouble, drug addiction, and a number of other problems without descending into the hypocrisy he loathed. Maybe you wouldn’t like it if you weren’t a fan, I’m not sure, but it is at least worth a look. 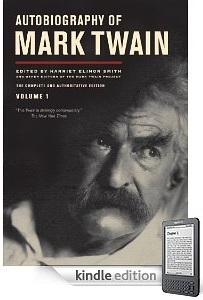 Everybody knows who Mark Twain was. The funny thing is that he knew they would for a long time to come well before he died. This is the first volume of three, the next of which won’t be released for another 25 years. It’s a fun read, if a little bit self-serving at times. This is one place where the Kindle edition really stands out for making a heavily annotated edition easier to read. All the footnotes, author’s notes, original dictation transcription, etc are hyperlinked to the relevant section of the main text. Normally, Kindle books make flipping back and forth to reference things a pain, but this time it’s done right. If you’ve ever been curious about the author we all grew up reading and hearing about, this book provides a lot of answers. This entry was posted in E-Books, Kindle Books and tagged biography, Kindle Editions, Recommendations by matthew. Bookmark the permalink. While I hadn’t really considered that, it’s good to know! Nice to have you reading. I’ll admit that my international correspondence list isn’t particularly long, but I’d gotten the impression that Carlin was something of an internationally recognizable figure, at least. Live and learn, I suppose!